Off the Plan (Greenfield Sites). I have had the privilege of dealing with Paul Grant at Mike Phipps Finance for the purchase of a Quest re-sale. leading accommodation businesses dealing with numerous financers. then I could not recommend anyone else. In fact, I look forward to conducting more business with Paul and Mike Phipps Finance as they are the No 1 operator in the industry. Thank you for all your time and support. finance deal as Mike Phipps Finance. relation to the financing of management rights. clients are always in good hands and get the best result every time. and your team throughout your time with your previous employer. industry for many years to come." Start up purchases either off the plan or direct from the developer should be approached with a clear knowledge of the business model. In most cases lenders prefer experienced management rights operators although other complimentary experience is generally well regarded. Off the Plan purchase contracts will be predicated on a projected net profit which should be the subject of an accountant’s report, inclusive of projections and assumptions. The management rights contract should contain appropriate “claw back” provisions to ensure that any short fall in initial letting pool numbers is adjusted in terms of the purchase price. Generally the contract will specify an adjustment amount per unit for any letting pool shortfall. The purchaser then provides the stakeholder (usually the vendor’s solicitor) with a bank guarantee for the shortfall (retention amount) on the basis that provided the letting pool shortfall is made up within an agreed time frame (retention period) the balance purchase is paid via a call up of the bank guarantee. If there is still a shortfall at the end of the retention period (the adjustment date) the bank guarantee sum is partly allocated in line with the number of units achieved in the letting pool during the retention period. You can download the information detailed within our ‘Management Rights’ section as a printable PDF for future reference. Click here to access the PDF document. Frequently Asked Questions – Off The Plan Management Rights. 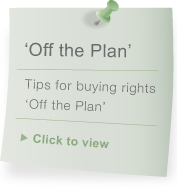 You can download our ‘Off the Plan Management Rights FAQs’ as a printable PDF for future reference. Click here to access the PDF document. There are a number of industry experts who specialize in the marketing of Off the Plan management rights. We are happy to place potential purchasers in touch with these industry professionals.